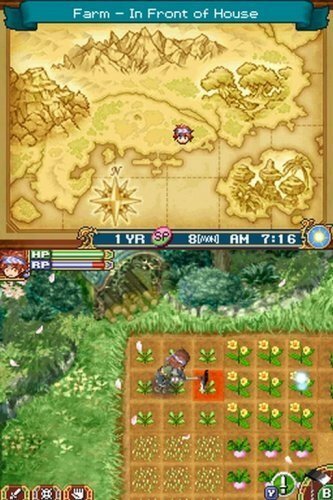 Rune Factory 2 was released in North America one year after the success of the first game and continues to offer the same mixture of fantasy and Harvest Moon style gameplay as the original game did. In Rune Factory 2 players will return to the same universe as the first game but with a whole new story and characters. This time around players will follow the story of an amnesiac boy who wanders into the town known as Alvarna. Upon arriving in the town he is helped out by a Mana (a local girl) who provides him with some farmland and tools to make a new life for himself. Eventually he settles into his new life and has a child with his wife. One day though the player remembers why they came to Alvarna and leaves the farm for their son or daughter to look after. Curious about their father’s disappearance their offspring slowly unravels the mysteries of a powerful dragon force. In the game players will get to play as both the father and their offspring which is a very interesting and innovate game element that allows you to explore the storyline over two different generations. Much of your time in both generations will be spent on the farm growing crops and then selling them for money. Players can also spend time in their house, battling or capturing a variety of monsters in the season based dungeons, browsing the town’s shops, making friends and participating in the large range of festivals that occur during the year. 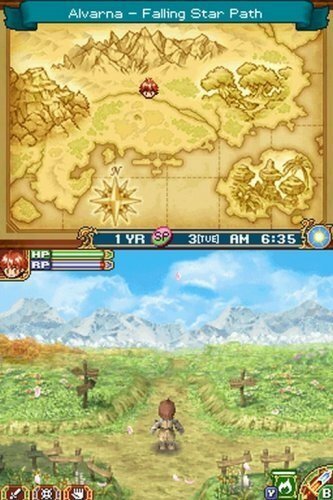 Players will have to carefully manage their time if they are to be successful in Rune Factory 2. Choosing how best to spend your time each day is important with a game minute passing every second that the player is performing a task. The weather in the game is also closely tied with the time system with all four seasons lasting 30 days in the 120 day calendar. Weather also presents its own challenge each day with different weather each day requiring the player to act accordingly. Since Rune Factory 2 is a stand alone game players need not play the first game before entering the Rune Factory world, but its still recommended for the best experience. Unique storyline that spans two generations. Manage your time carefully to get the most out of every game day. Balance farming with monster killing and capturing. Pursue friend and love points with NPCs. Plenty of improvements on the original Rune Factory game.